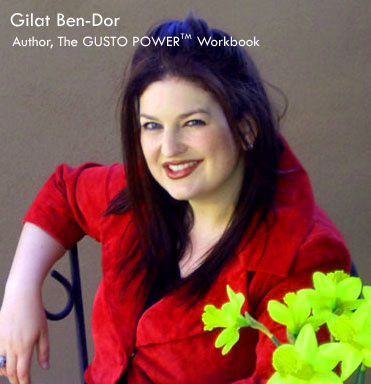 Gilat Ben-Dor, MBA, CSW, is an author, speaker, coach/consultant, and the founder of GUSTO POWER™, a leadership development program that helps Multi-Passionate Professionals™ successfully manage their many talents. A creative “multipreneur” herself, Gilat has created several successful businesses. Gilat has worked in both corporate and small business sectors, in areas from Human Resources to Training and Development, and Higher Education Administration. In addition to The GUSTO POWER Workbook, Gilat Ben-Dor is the author of The Confetti Path: 101 Ways to Celebrate Your Passions and Inspire Creativity, a lively book full of tips, quotes, and acitivites; and The Rainbow Blueprint: An Action Journal for Those With Many Passions, a beautiful journal that contains both action and reflection steps for combining multiple passions into daily life. Gilat Ben-Dor is a member of the International Coach Federation (ICF), the National Speakers Association (NSA), Meeting Professionals International (MPI), the Arizona Book Publishers Association (ABPA) and the Society of Wine Educators (SWE).